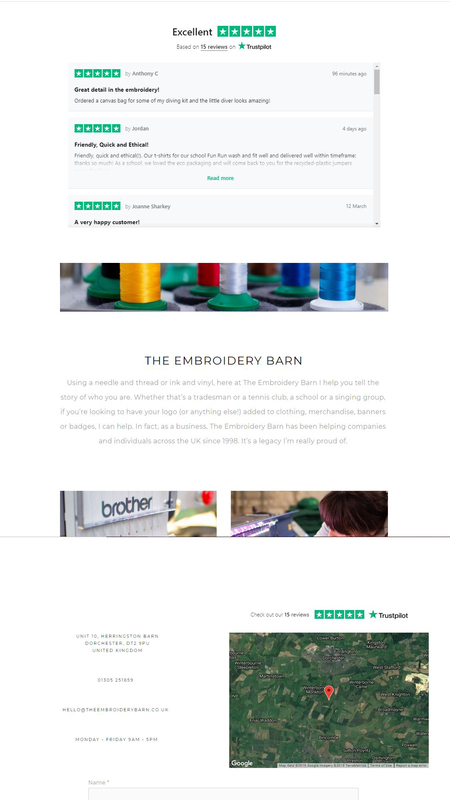 Rosie has recently taken over The Embroidery Barn and wanted a website that reflected the business as well as her new eco friendly practices. With the e-commerce already set up in another platform, Rosie wanted a Squarespace website that linked to this. Connect Trustpilot so that reviews were shown in a list on the home page and the star rating was shown on the contact page and in the footer. Connect Instagram and show the grid on the home page. Input content in a way that reflects the brand and looks professional. Create blog templates for Rosie and her staff to use to ensure consistency is kept throughout. Using an existing domain, connect this from GoDaddy to the site. This work was completed within a week and Rosie was kept updated every step of the way. Her input meant that even the tiniest details were approved before moving onto the next section of the site.